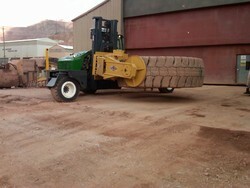 We offer Material Handling Forklifts at timely delivery of this product range, at leading market prices. 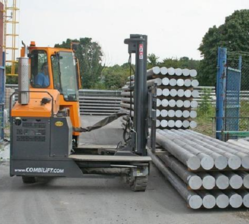 The Steel Pipe Handling Forklift is designed to handle long, heavy and awkward loads. 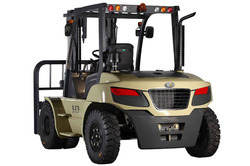 The largest Forklift consists of 4-way trucks, the forklift can meet the needs of a multitude of material handling sectors. With the support of our talented team of professionals, we are involved in offering the best quality Huge Tyre Handling Forklift. This Tyre Handle is known for its supreme quality and high durability. We are offering this Tyre Handle to customers in various sizes and specifications. Tyre Handle has extensively used this roller for seating tire patches as well as making fabric repairs and in many other applications. Our products are easily available in the market. 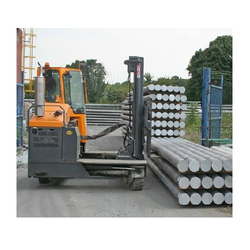 Steel Pipe Handling Forklift is designed to handle long, heavy and awkward loads. The largest in the Combilift catalogue of 4-way trucks it can meet the needs of a multitude of material handling sectors. Available with a range of high performance industrial engine,big torque at low speed,make the whole machine quiet, with less vibration and efficient. 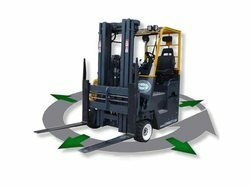 Ergonomically design,such as the Long operator assisted grips / two level access entry / Non-slip rubber floor mat / adjustable seat / adjustable tilt steering column,all these provide a comfortable and safe working condition for various operator. High efficiency is also delivered through the performance of the axles,the excellent brake system make sure the forklift operate with safety,the steering axle provide prompt and precise feedback to the driver when steering. The wide-view mast provide the operator with a wide visibility,improve the efficiency and guarantee the safety. Pin Type Fork with Fork Positioner is standard in this range to improve the working efficiency. 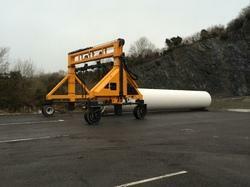 Cement Pipe Handling Trucks are found to be very suitable for handling Cement Pipes. Usage of such mechanised solution has increased the material flow.